4.8 million people last night watched OJ Simpson confess to murder. Bob Enyart discusses, in light of Simpson’s acquittal and now his public confession, God’s criminal justice system. O.J. once criticized us here at BEL for purchasing at auction and destroying the memorabilia he had hanging in his Brentwood living room. Meanwhile, Chris Matthews, the host of MS-NBC’s Hardball, and, of all people, Jon Stewart, took an interest. Also, thank you to those who’ve donated so far, $8,000 toward our annual BEL winter telethon goal of $50,000 to keep us broadcasting for another year. So please help if you can! We have a long way to go! And from kgov.com/oj: This Bob Enyart Live protest of the murderer O.J. Simpson was also reported in Sports Illustrated, the New York Times, the www.boston.com/news/daily/17/simpson.htm+]Boston Globe[/url] [or pdf], Houston Chronicle, and hundreds of other papers via the AP, by CNN, MS-NBC, Comedy Central, Getty Images, CBS News, the San Francisco Chronicle's Peter Hartlaub, the L.A. Times' Mike Downey, in BBC flashbacks, KGOV.com, People magazine, etc. 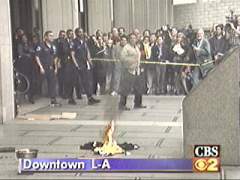 "We had a bit of a bonfire going there at the L.A. courthouse," said Christian talk radio host Bob Enyart in regards to the burning of several O.J. Simpson articles on Wednesday, February 17, 1999. 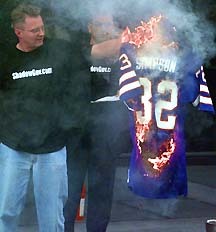 The burning of the auctioned O.J. 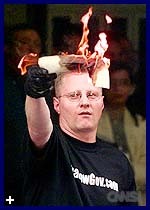 memorabilia was reported across the United States, by CBC News in Canada, by the BBC in England, and then around the world. In a 48-hour period a band of ten individuals wearing black ShadowGov.com t-shirts turned the L.A. courthouse upside down and generated a media frenzy. 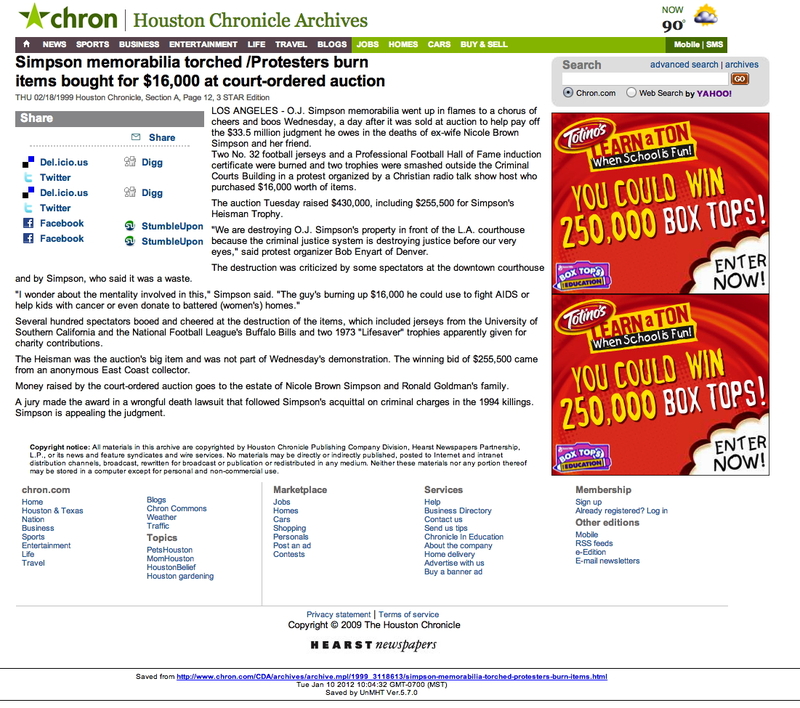 The Associated Press article printed in most of the major newspapers across the United States, reported that it was "a protest organized by a Christian radio talk show host." Yet, where did this group come from? What was the point?The project to buy and burn O.J. Simpson’s Hall of Fame Award, as well as several other sports items, became reality on those steps of the L.A. courthouse. But, why did Bob organize this protest? "Since the government will not put O.J. to death, then it is left to those who care about righteousness to do what we can, and that is, to put to death the memory of his career. "A generation needs to learn right from wrong, and blotting O.J.’s memory from the Hall of Fame will accomplish that better than a thousand sermons.“...to use this event to proclaim that many Christians still know right from wrong, that O.J. 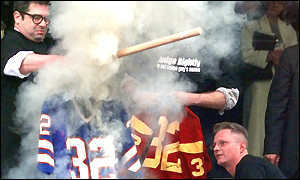 should have been convicted and executed, and that we should no longer honor his name.“We also hope that this effort will help convince Ron Goldman’s family that justice and righteousness exist, and that the God of Righteousness exists, even though the courts no longer exhibit a knowledge of Him.”The event was criticized by some as being nothing more than a publicity stunt. Publicity stunt? Is it a publicity stunt because it got publicity? If you were trying to announce to the world that our courts have failed us, that changes need to be made in the justice system, and that the country shouldn’t honor an obvious murderer, would you say it so that nobody hears you? “What about them wearing those shirts with his website on it?” ShadowGov.com is a cyber game similar to fantasy football. Its purpose is to train men on how to judge rightly. By advertising ShadowGov.com, Bob has helped to continue the message he was presenting. He has provided access to a place where men and women can find out how to change, and improve today’s society.Local radio personalities questioned if Bob took the $16,000 from donations to his “ministry,” and therefore shouldn’t have been used for destroying O.J.’s memorabilia. Rush Limbaugh is not a minister, and neither is Bob Enyart [back then; Denver Bible Church was planted by a sister church in January, 2000, with Bob as pastor]. Bob receives money from selling audio and videos of his shows and seminars, the same as Rush. A bank account was created to contain all of the funds which people donated for the sole-purpose of this O.J. protest. No money was taken from any other donations.Though MS-NBC provided the most thorough coverage, with Bob Enyart on for a total of a couple hours during the 48 hours following the auction, most of the media did a poor job reporting the facts. Some of the public's misconceptions may be attributed to the vague media coverage. The majority of televised media coverage was only interested in showing the fire, and didn’t bother relaying the proclamations. The printed media failed to contribute much more. The following is the only quote reported by the Associated Press:“We are destroying O.J. Simpson’s property in front of the L.A. courthouse because the criminal justice system is destroying justice before our very eyes.”Was this all Bob had to say? Was this the reason he spent $16,000 dollars to burn the articles of a murderer? No. Whether the media ignores this fact, much more was presented on those steps. Here are only some of the statements presented by Bob Enyart and ShadowGov.com:“We call upon Congress to make three Criminal Justice system reforms. To which Bob responded, "O.J. is not qualified to decide what is right or wrong" and through the Associated Press, "O.J. wants to beat up women and have others pay to protect them." * Who Is this Bob Enyart Anyway? Bob has been a conservative radio talk show host in Denver since April 1991. In 1993, the Denver Post and Rocky Mountain News described him as "Denver’s answer to Rush Limbaugh" and in 2015 the London Times described him as an "evangelical Dirty Harry". In April 1993, Bob expanded into television, with Bob Enyart Live!. The live, call-in talk show first aired out of a little television station in Elizabeth, CO, with a very limited broadcasting range. The studio was so small, that the camera had to be placed on the opposite side of a glass door.A year and a half later, Bob Enyart Live aired live via satellite in twelve cities around the nation. The show moved to a larger studio in South Bend, Indiana, where it began to stretch across the country. At the end of 1998 the show that told people to “Do Right and Risk the Consequences,” was being televised in more than 80 cities, with a potential audience of seventeen million households!Bob’s strong views against abortion, homosexuality, liberals, the “just-a-system,” and the morals of today’s society quickly caught the attention of his audience. Several groups have attempted to get Bob Enyart Live! removed from the airwaves, but have remained unsuccessful. Colorado’s former US Representative Pat Schroeder, and Wisconsin’s US Senator Russ Feingold, attempted to have the show censored by the government, but after investigation by the FCC and the FBI, their requests were denied.Due to a tight budget, Bob Enyart chose to re-organize, and re-examine the future of his show. In November 1998, Bob canceled his show at the height of its popularity and looked into restarting his program again on radio only.On Monday, December 7, 1998, at 10:30 p.m., Bob Enyart Presents premiered in Denver on a new station. The show has been shortened to half-an-hour, and his unique introduction as, “the Nations most popular, self-proclaimed, right-wing religious fanatic, homophobic, anti-choice talk show host,” is no more, but Bob hasn’t faltered in providing the reality of truth, justice, and the existence of an all-powerful, righteous God.See also kgov.com/about.